I thought I would turn to the most knowledgable group of armor people on the planet (a little smoozing first) to find out something about this kit. I know it is a repop of an old Tamiya kit, and that there are better ones available, but you fight a war with what you've got, and this is what I've got. What I need is a sort of list of things wrong with the kit (front fender, etc.) that maybe can be corrected with some scratch-building. Maybe someone here can list some things, or point out a list somewhere that comments on the errors? I may be able to fix some of the stuff (I'm not worried about the holes in the bottom of the chasis for the motor). If anyone could help me out, I would appreciate it. I'm planning a small diorama later this year using this old kit and am just gathering information. Hopefully, it will look something like this, though it will be a Panzer IV instead of a Panzer V.
I always liked that photo and thought it would make a good diorama. That said, I think that when you park your tank in a building with that much stuff covering it up, one may not need to worry about too many errors on the model. Ixion> No problem! At least you looked. Yes, I thought that picture was a good idea of what I was planning. I wanted it in an Italian setting, early 1944. I have some nice winter-time figures to place around, two rolling barrels so I thought a refueling diorama might be nice, instead of the reloading one shown in the picture. I’ve built their release of this kit with the schurzen many years back. Overall it is not a bad kit. Since this kit does not have that feature, that is one thing that you don’t have to worry about. But I would suggest some replacement tracks for a better look. That will likely include new sprockets to fit those tracks. Academy used to make some Panzer IV tracks that were ideal for this. You may want to replace the commanders AA gun, or leave it off. The kit Jerry cans are best replaced as well. The schurzen are not to scale, but as Stik mentioned, I guess they aren't included on the Academy kit. The Tamiya ones are probably 3 inches thick if you do the math. A old Eduard PE set would probably be the first order of business, or just leave them off all together. The tool placements are all wonky; the axe, track tool, jack, shovel and cleaning rods all need to be relocated. If I had a scanner, I'd show you some drawings. Maybe I can cobble together some photos, but this will take some time and I need to throw dinner together soon. Then again, I don't know if Academy fixed these problems or not? Stik> Thanks! Unfortunately, I'm going to have to forgo all that, unless I can scratch-build it. Money is rather tight, and for all that I could just buy a better kit! I do appreciate you pointing out the problems. NOTE: Donations of left-over spare parts will be appreciated! Ixion> This particular kit has NO schurzen, so that problem is solved. If there are any, they will have to be scratch-built. Got any schematics or plans for those? Did find a nice build review listing some of the things, so I'm making progress. Just to clarify, I assume you are building this as an Ausf H? Even then, there are differences between early H and late, such as the straight or angled rear hull plates, muzzle brake, etc. Ixion> Well, I hope so! The instructions actually say "Ausf. H" and nowhere mention the "J", so I'm a bit puzzled by the differences. I have some research to do! Let's not talk about zimmerit! I'm going to assume that this one was produced before December of 1943, and place it in Italy in January/February of 1944. I think that would be reasonable. As to fenders, muzzle brakes, angles and view ports, well I'm just going to have to read up. Good thing I don't plan on starting this until summer! Now that we have a time-line established, we can proceed to the nit-picking of details. Since this isn't a rush job, we can try our best to perform the sow's ear to silk purse maneuver, and hopefully stay within budget. While I have the resources available to help you with this endeavor, it's still a tricky business to catch all the changes. I'm signing off for the night, but I'll be back with some drawings later this weekend. Although I'm not sure how you plan to evade the Zimmerit issue. Sure, it's a PITA doing it old-school, but what are ya gonna to do? Blow more money than you spent on the kit to buy pre-made stuff that doesn't fit anyway? Personally, I find making scratch schurzen much more of a pain than doing Zimmerit, way too many fiddley brackets to build / align and too much feeding of the carpet monster....believe me, I've done it. We can narrow it down even further, I think. 26th Panzer Division at Anzio, late January / early February 1944. I think this one shown in March, 1944 would be close. I can't make it out, but it doesn't appear to have zemmerit applied, though it does have the turret schurzen. As I understand (and someone can tell me I'm mistaken), zemmerit began to be applied in November / December 1943. A Panzer IV Ausf. H without it in early 1944 would not be unusual... maybe. Anyway, I look forward to any information you may supply! Thanks! Zimmerit application began in Sept. 1943 and ran to Sept. 1944. Ausf H production began in the first days of May, 1943, so you have 4 months of Ausf H production without Zimmerit. The photo you posted is a early Ausf H, as evident by the bolted-on 30mm armor on the hull and repositioned antenna. It doesn't appear to have Zimmerit. A large, but grainy photo of this vehicle can be found on page 141 of Jentz's Panzer Truppen, Vol II., The fahrgestellnummer is visible just to the left of the hull MG and appears to be 85384, which is of great help in identifying it's production date, assuming I have that info somewhere and that I can find it. which I should. Knowing that online sources can be suspect, do you have a source that places its use in Sept. '43? Curious. Yeah.... this is a can of worms. I'll start with the works of the esteemed Thomas Jentz and work downhill from there. On page 190 of Jentz's; Germany's Tiger Tanks, D.W.to Tiger I, Appendix F, note 4, he states that "Zimmerit application began in August 1943" (on Tiger I's at least). Then on page 61 of Jentz's; Germany's Panther Tank, The Quest for Combat Supremacy, footnote 4.3.2, he states; "Starting in September 1943, Zimmerit was applied at the factory...". Tom Cockle and Gary Edmundson's Osprey book; Modelling the Late Panzerkampfwagen IV, page 32 states; "Zimmerit was an anti-magnetic mine compound applied to the vertical surfaces of some German armored vehicles from September 1943 until September 1944." I doubt that all the assembly plants were supplied with the materials, tools and training at the same time, this would lead to a staggered start time for application to begin. The end date is firmly established by OKH order on Sept. 9th, 1944. I don't know what various websites use for references, since they don't usually bother listing them, but the authors I've quoted are some of the most respected in this field, especially Thomas Jentz. Ixion> Thanks again! That does sound like a can of worms. Rather hit or miss. I have seem images of IVs with zimmerit applied only to the schurzen, and one photo claiming the zimmerit was field applied, so I'm just a bit "hmmm...". I think I will skip the zimmerit at the moment (and maybe apply it only to the schurzen). Or I may go ahead and completely cover the tank in mud. Got time to consider the options, and discover more information. Thanks for taking the time to relate all that data! Then there is the whole "Zimmerit on the schurzen" dates debate....not going there. It took a little rummaging around to find it, but this is a early Ausf H, with the bolt-on 30mm armor plate, (June, 1943 production). Sorry about the crummy image quality, but I shot it with my phone under my desk lamp, then beat on it in Photoshop. Couldn't tell, huh? Oh well, it should be good enough for tool placement at least. Although our subject vehicle doesn't have the auxillary air filters as shown here. Perhaps they were scraped off in action or possibly never mounted in the first place. I was hoping that my copy of Panzer IV and it's Variants would have a time-line/fahrgestellnummer chart that would plot the design changes, but alas, it does not. And what else do we learn? Not even this publication is apparently free from errors, as the accompanying discusson reveals. Also note, according to this chart, our subject should have been fitted with the Filzbalg (sounds contagious) air filters, (see first entry under Aufbau). This means they were either removed by the crew/workshop, or lost in combat. Some sort of welded plug must therefore be present covering the resulting hole, although I'm not clear on how intakes entered the engine compartment. A couple of other small items that are missing from the kit are the springs for the front mudflaps and the small reinforcing straps on the upper, inside edge of the front mudguards where they meet the hull, just above and rearward of the springs. One also needs to drill out the towing shackle on the rear and add the pin and retainer chain. Ixion> That's a good list from Panzer Tracts, and I'll save it for later reference. It's amusing to read the discussion on the rear brackets for the tracks. It sounds like ecclesiastics arguing about how many angels can dance on the head of a pin! But that's okay, as it is these small details that get lost in history, and perhaps will never be completely resolved. And that is a much better image of that particular Panzer IV. I wonder if I could find that particular overpass on Google Earth? Might be a frustrating search. My goal at this time is to try to fix the major errors on the kit, and try to keep the cost down. I sort of like scratch building, although getting details right can be hit or miss without some sort of detailed plan or image. 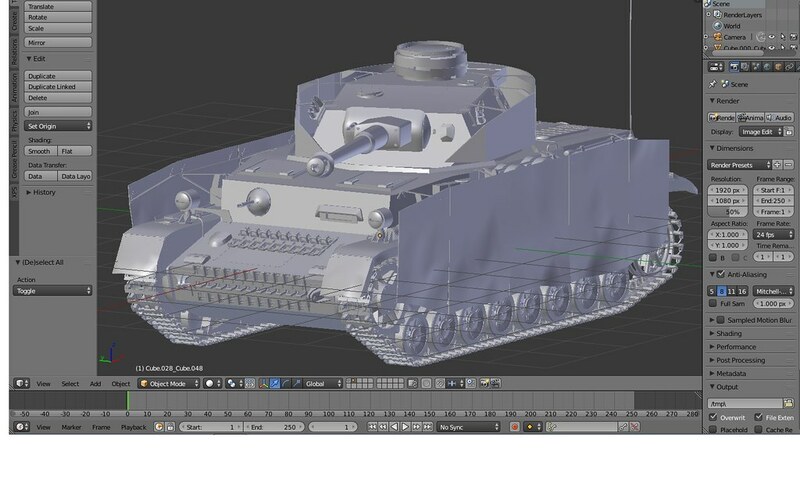 In that regard, I've saved out this page with the 3d CAD images of Border's new Panzer IV model (its a G). What wouldn't I give to have some good CAD drawings (I was a CAD operator for over 30 years). And thanks for the image of the Panzer IV top down view! That will help locating things. Not sure how useful this will be, but I found a "paper model" of the Panzer IV Ausf. H that can be used for templates (downloadable PDF file). How accurate it is, I can't say. The turret schurzen seems to be a later model (if I understand the time-line correctly). Still, you go with what you've got! Again, thanks for your help! You've gone above and beyond! No need to worry too much about looking for more stuff. I'm still a ways off from starting, so there's plenty of time for research. Got to finish up a few other projects before I get to this one. PS> Forgot about Sketchfab! Found this Panzer IV model on there. It may come in handy for making schurzen. I did think the argument over spare track placement was rather petty and amusing, as if this somehow invalidates the entire publication. But then again, it probably was replaced long ago. Somewhat surprising this one was still standing for when this photo was taken. I get the feeling I've reached TMI overload. But if there's anything else you might need, just ask. I'm glad to be of assistance. Ixion> My thanks! I appreciate you taking the time to educate me a bit. There's never enough information, there's usually not enough! 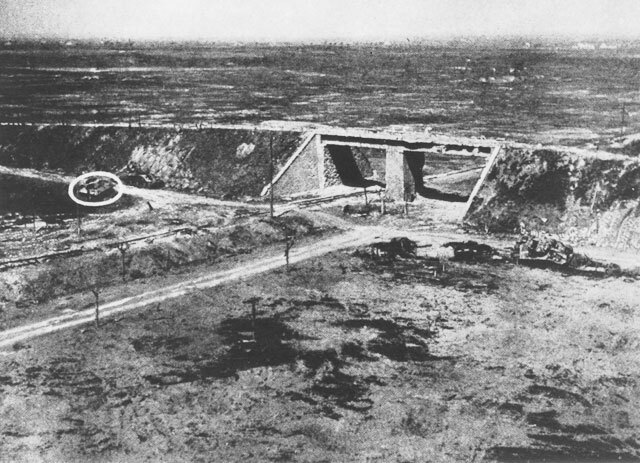 Just fyi, and I may be wrong, but that picture appears to be what was called the "flyover" at Anzio. Yes, I believe you are correct on that. Ok, good to to know. But just to be clear, it is a railroad bridge? To me it looks like an overpass. The railroad appears to run through the left opening of the bridge (at least, to me). Oh, and that image of the Panzer IV? I took the time to look it up in the Bundesarchiv using the listed number. It didn't have much information except that it was taken in Italy - Bruckenkopf Nettuno ("bridgehead" which I assume means battle line). Here's a link. Upon studying that Panzer IV again, I must admit that it is a weather-worn, beaten up old tank! The mud guards are torn and twisted and it's missing its left fender. Its seen better days. "Sunny Italy" has not been kind! PS> Apparently this site does not like linking! I’d have to look it up in my books. All I do remember is that there was a serious fight there during one of the German counterattacks on the Anzio beachhead. It was a critical defensive position. So much for trying to compare this with 1944. 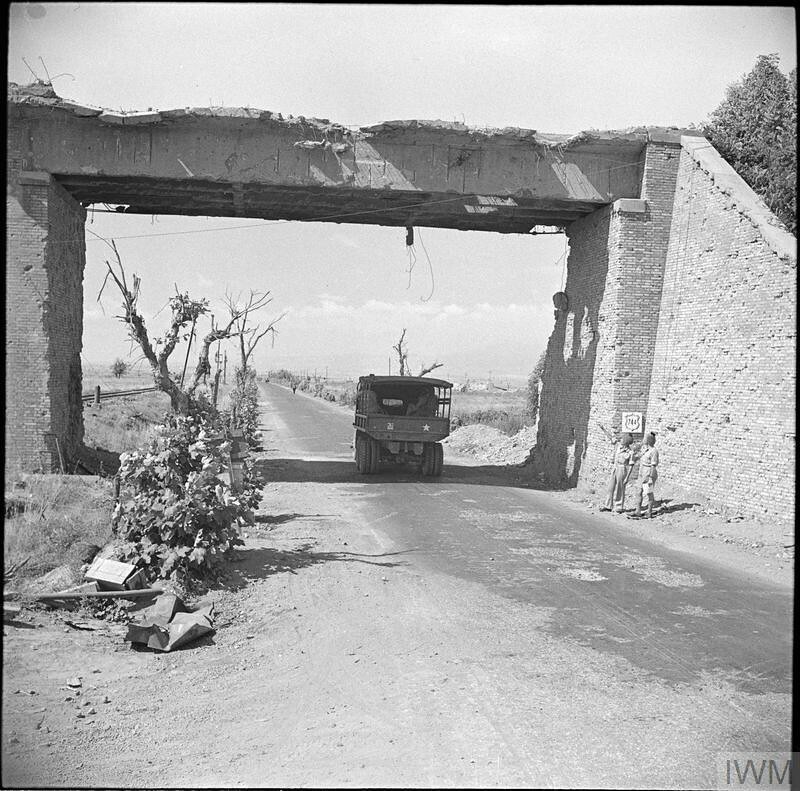 I too checked the Anzio battlefield map and it shows that it was a road overpass. Labeled "first overpass" on the left side of the map. The railroad does run under the left-side tunnel. It is quite possible that the shot of the Panzer IV is the "Flyover". That our subject vehicle was photographed at "The Flyover", (as I now know it was called), crossed my mind too, although trying to prove this based on a single photo now seems dubious at best. Did 26th Pz. ever reach this spot? More research is required. Having a date on this photo would really help! Found this online, a view of the Flyover at a later period. 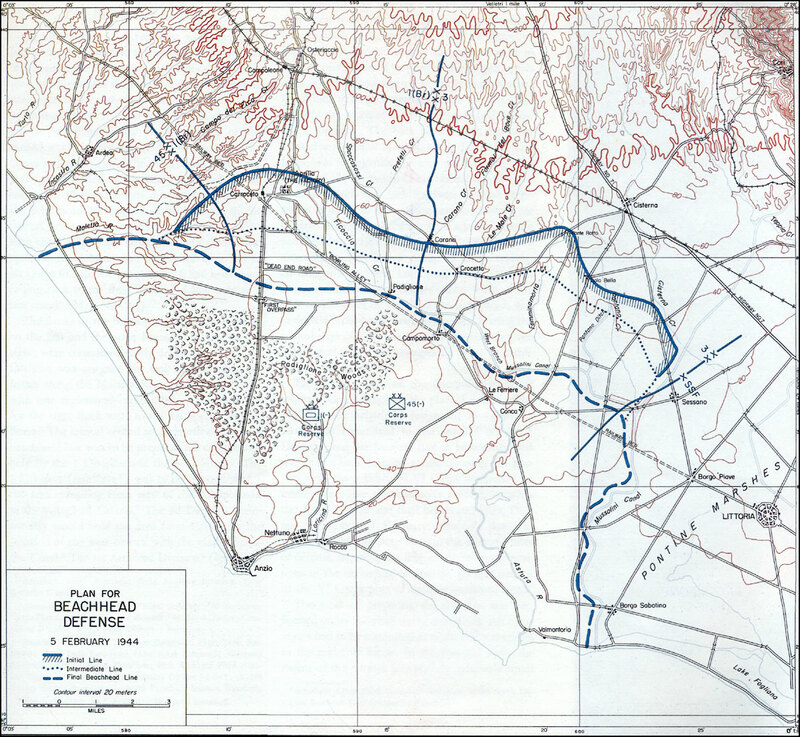 A map on page 26 of Osprey's Anzio 1944, shows 26th Pz stationed to the east of Cisterna on Feb 1, 1944, about 10-12 miles ENE of The Flyover, also called the "First Overpass." I will say that it appears the brick work on the Flyover and the overpass in the Panzer IV photo are different, so I would say the Panzer IV photo was taken elsewhere. Similar design, however. That Google 3d view is interesting, and allowed me to look around the bridge as it appears in more recent times.